Do you use hashtags for marketing campaigns on Twitter? Looking for hashtag tools to help improve your use of hashtags? In this article, you’ll find seven hashtag tools for researching and reporting on Twitter hashtags. 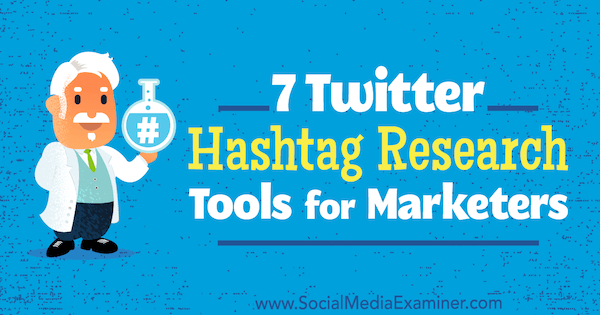 7 Twitter Hashtag Research Tools for Marketers by Lindsay Bartels on Social Media Examiner. Why Is Researching Twitter Hashtags Important? Twitter users often follow hashtags that pertain to their interests, so social media marketers can use targeted hashtags to improve their reach among users with specific interests. However, with only 280 characters in which to squeeze both your message and hashtags, you need to choose the hashtags you target carefully. When you set aside time to research what hashtags are the most popular with your customer personas, you’re better able to target users who reflect your ideal audience. Luckily, several tools available can help you identify and track the best hashtags for your industry. Each tool has its own strengths. However, generally speaking, a research tool can help you monitor hashtags, improve influencer outreach, discover demographic and geographic information, and gauge sentiment. With the right toolbox, you can simplify social marketing on Twitter. 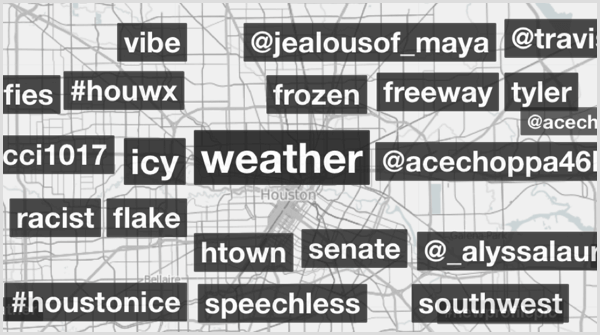 RiteTag helps you find new hashtags and track your current hashtags. In addition to showing important hashtag data, this tool helps you find the best possible hashtags for your text and images. With the handy Chrome extension, you can highlight text or right-click an image (as shown below) and instantly get hashtag suggestions for it. 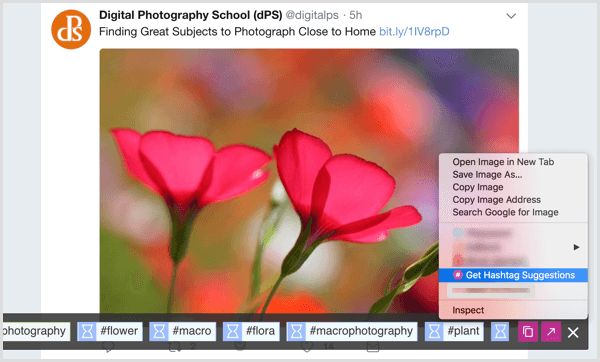 The RiteTag hashtag search feature organizes results so you can see at a glance which related hashtags will help your tweet visibility now or over time. The results also indicate which related hashtags are less popular. For $49 per year, you can use RiteTag for up to 1,000 queries a month for both images and text. Other plans are available if you’re looking for help crafting, publishing, or enhancing posts; these plans range from $7.50 to $15 per month. With ExportTweet, you can track hashtags, keywords, and accounts. 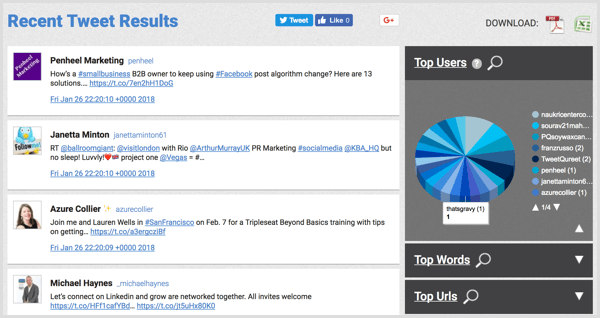 This tool also helps you find top tweets, related hashtags, influencer data, device source, geographic location, and more. The free tool (accessed via the Try Now button) gives information on the last 100 tweets, but the paid searches offer unlimited tracking time and unlimited report downloads. With the pay-as-you-go pricing options, ExportTweet is a great option for new hashtag trackers or those who want to focus on only a few hashtags. 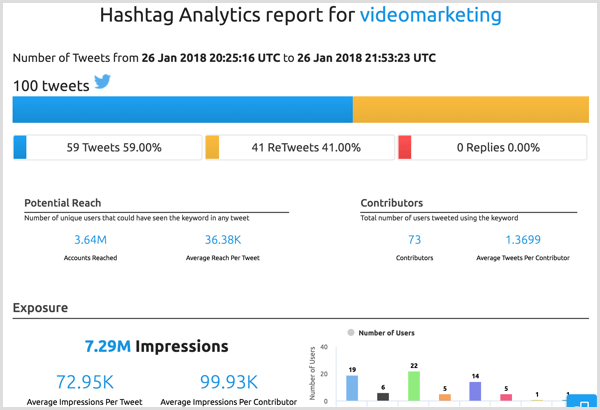 You can purchase reports for both real-time hashtag tracking (25,000+ tweets) and hashtag historical data (2,000+ tweets), which include CSV spreadsheets of top related hashtags and all images, videos, and URLs. Real-time reports start at $19.99, and historical data reports start at $16.99. If you’re not sure where to start with your hashtags and prefer a more visual interface, check out the Hashtagify search tool. Like other search tools, it helps you find relevant hashtags. In addition to data about a hashtag’s popularity over time, you can see which influencers use the hashtag and get details about the hashtag’s reach in different languages and geographic areas. The search tool is free to use. You can purchase a Hashtagify plan starting at $9 per month to add hashtag trackers, two months of data storage, full access to the top ranking hashtags, and a bookmark feature to save any favorite hashtags. 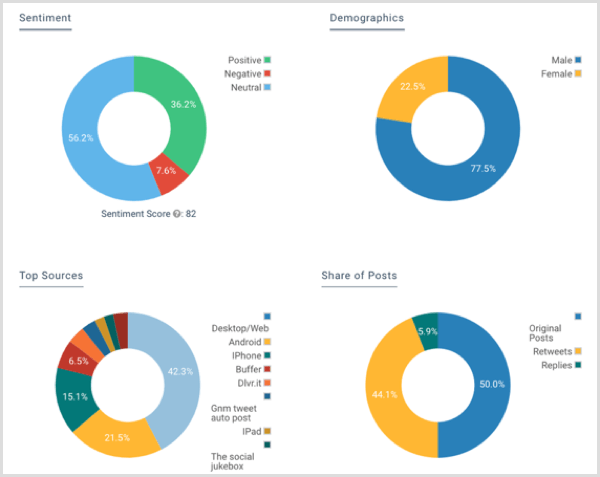 With the free report, you’ll see the top associated words, top URLs associated with the hashtag, the source of the top tweets, top languages used, user mentions, associated hashtags, and an influencer index. For $14.99 per month, you gain the ability to download data and receive three archives that are updated every hour. If you don’t want a recurring monthly payment plan, other pricing options are also available. For a local business, Trendsmap is an amazing tool for finding trending hashtags in your area. This tool will reveal the most popular trending topics on Twitter based on geographic data. Yes, you can use Twitter itself for this, but you get only a few trending topics compared to the many you’ll see via Trendsmap. Trendsmap has a free search feature and pricing options that start at $25 per month. The free search feature provides only real-time hashtag data, whereas the paid plans offer longer historical data. 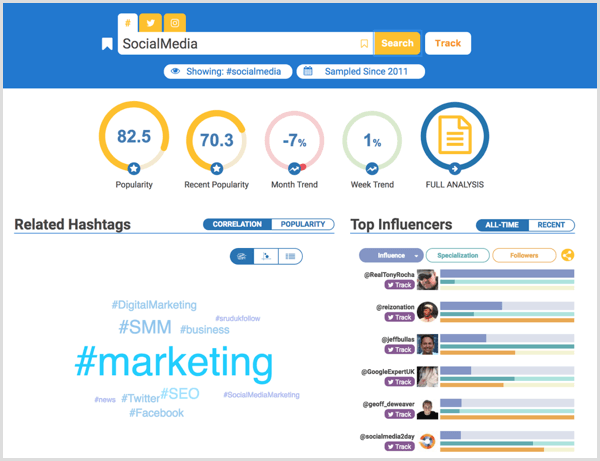 With the free search, you’ll have to find your location and zoom in to see the top hashtags, users, and words. With the paid plan, you can narrow your search by your physical location, city, or region and customize whether you see hashtags, users, or words. Socialert is a budget-friendly tool, making it perfect for individual users or small businesses. You can do a free search before the tool asks you to upgrade to a paid plan. 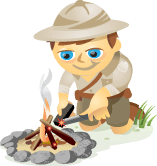 The free search will analyze 300 tweets over a 7-day period to give you a snapshot of relevant data. You’ll see the hashtag reach and impression rate along with geographic data and overall sentiment. Keyhole has a free search function for surface-level analytics. Enter a hashtag you want to research. 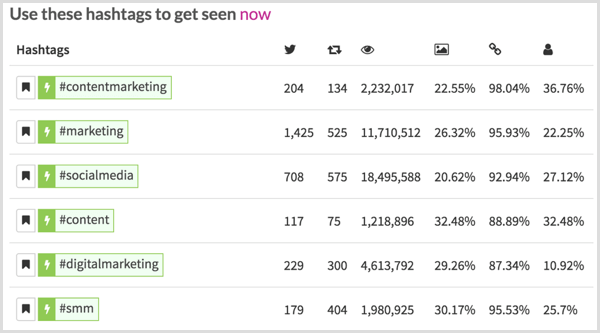 In the results, you’ll see data that’s useful for quickly gathering general information on a hashtag. 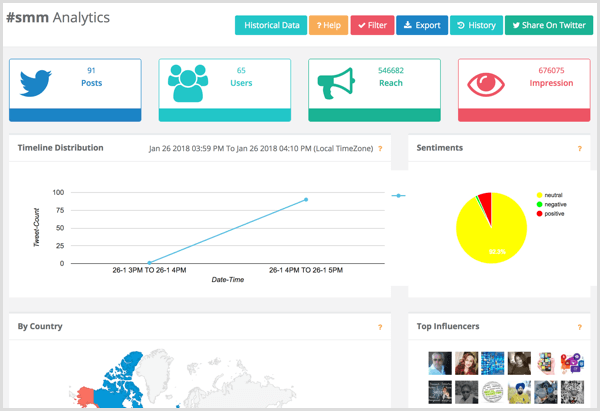 Get real-time data on the number of posts, users, impressions, reach, demographics, sentiment, and top sources. For additional features, upgrade to one of the paid plans. With Facebook’s new algorithm change, you may need to focus more on your Twitter marketing. Hashtag usage is incredibly important for Twitter, and many tools can help you track hashtags for Twitter optimization. However, some tools may be more useful to you than others. Every social media campaign has its own strategy, so the level of data you need for each will vary. The free search functions will help you gather initial data, but you might want to dig deeper in other cases. What do you think? Have you used any of these hashtag tracking resources? What tools have you found most useful? Please share your thoughts in the comments. Lindsay is a Social Media Strategist at an ad agency in the Houston area.